The first to fluorish in our backyard garden are the green beans. We have had an abundance of them and we’ve cooked them every which way imaginable. This is one of the simplest ways of cooking green beans, and it’s an old standby in our kitchen. I didn’t put any proportions on purpose because most of the time it depends on how much green beans I have on hand and what mood I’m in. Experiment with the proportions according to your taste. This is very basic, all you have to do is heat some oil and sautee the tomatoes and onions. 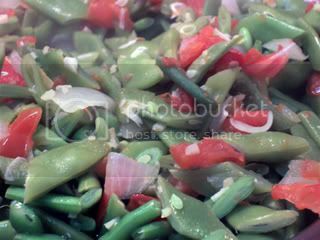 After they have softened and become fragrant, add the green beans and season with salt and pepper. I don’t add any water, I just wash the green beans prior to putting them in the pot and the moisture remaining on them is usually enough to cook them through. Cover and cook for five minutes. I put the timer on for this so as not to overcook the beans. We all have soggy green beans. hi sue, thanks! My husband, bless him, got our garden started early this year so we’ve been eating out of it for over a month now. I love it! It is funny but our green beans are not ready just yet. I think they need about another week. Please join Pangasinan wikipedia at http://pag.wikipedia.org . Thanks and more power. Hi, JMom! It must be such a treat to be able to grow your own vegetables. I could almost taste how crisp and fresh those green beans must have been!